What makes Indiana Jones the greatest movie character ever? Artefact-stealer. Whip-cracker. Boulder-avoider. It’s fair to say that Indiana Jones’s popularity has barely waned since he burst on to the scene in 1981’s Raiders of the Lost Ark. Instantly iconic, he’s the full package when it comes to big-screen heroes: rave, physically capable, smart, funny, ruggedly handsome, nice hat... He's also got the iconography (the hat again, and that whip), he's an archetypal adventurer who harks back to the matinee idols of the past without seeming like a pastiche. So it’s little surprise that he ranks number one in our sister publication Total Film magazine’s countdown of the Greatest Movie Characters of all time. We asked you to vote for your favourite film character and the results don’t lie - Indy comes out on top. You can find out who the other 99 characters are in the special issue of Total Film - which has 100(!) different collectable covers - on sale now, but first, let’s talk about why the adventurous archaeologist is still so popular after all these years. 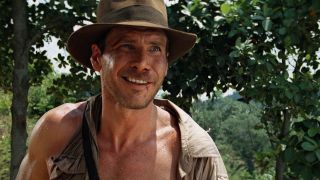 I always figured that Indiana Jones would perform well in our Greatest Movie Characters poll, but I was still taken aback when he surged to the top of the list and stayed there. After all, hadn’t Kingdom of the Crystal Skull dented his popularity? It seems nothing can keep a true icon down. So just what is it that makes him so popular? Well, obviously the era you grew up in had a huge influence on who you voted for, which explains why the ’80s was the most popular decade (given the average age of our readers). Films imprint on your impressionable mind at a young age in a way that’s almost impossible to shift. And the best films will get shown to generation after generation, meaning that a stalwart like Indiana Jones has been a fixture of kids’ holiday viewing for more than 30 years now. That’s a lot of goodwill that’s been reinforced. Fittingly, I remember first seeing Raiders of the Lost Ark as a kid. The stunts made my jaw drop, the melting faces cost me several nights’ sleep, and Indiana Jones felt like a character who’d already existed for years, even if I’d only just discovered him. "A throwback to a bygone era in both style and substance, as a character, Indy has felt lived-in from the off." And I guess that was kind of the point. With creator/executive producer George Lucas and director Steven Spielberg harking back to the matinee adventure serials of their youth, this was a film that felt nostalgic even when it was brand new. The fact that the films have aged so well thanks to the reliance on practical effects means Indy’s legacy is likely to live on and on. Even his name – Indiana Jones – juxtaposing the grand and the everyday, sounds like something from the ’40s. That name didn’t even appear in the title of his first film, but in that orange-yellow font, it’s a moniker that’s now synonymous with adventure (even if he was originally set to be Indiana Smith, before a last-minute veto by Spielberg). The hat, the jacket, the bullwhip… it all leads to the iconography of a character who’s instantly recognisable, even in silhouette (as exploited by the opening sequence of Kingdom of the Crystal Skull). Iconic is a word that’s thrown around a lot, but Indy actually deserves it. His outfit is one of the great instances of cinematic shorthand, telling you as much as you need to know about the character in the time it takes you to look him up and down. It takes more than just a great costume to make the Greatest Movie Character Of All Time™, though, and sometimes there’s an alchemy that comes with casting the right actor in the role. The general rule seems to be, if you want to create an all-time great, cast Harrison Ford if you can: he also appears at number three in Total Film’s poll as Han Solo, Star Wars snarky, rakish smuggler. And, in what’s since become movie folklore, Ford almost wasn’t even cast as Indy, as Lucas didn’t want to look like he was treading water after American Graffiti and Star Wars. Everyone knows that Tom Selleck almost bagged the role, and missed out due to Magnum PI commitments, but did you know that Jeff Bridges turned the role down, and that names as baffling as Nick Nolte, Steve Martin, Bill Murray, and Jack Nicholson were considered? Ford was cast only three weeks before shooting began, and the rest is history. Yes, he has the square-jawed matinee idol looks that make him perfect for those Drew Struzan posters, but he also pairs believable academic smarts with athletic prowess, making him as convincing in a museum as he is being dragged behind a moving vehicle. Despite all his heroic qualities, he’s still something of an everyman. No super powers. He bruises, bleeds, and there’s even an argument that he doesn’t actually influence the plot of Raiders as much as survive it. He has issues with his father and relationship troubles. Thanks to Ford, he’s a human being as well as an icon. Part of Indy’s ageless appeal also comes from the fact that Ford plays him as an archetype without ever winking too hard at the audience. And no one has really filled that gap while Indy has been away. Batman’s been rebooted over and over again, Bond has been succeeded (and then influenced) by Bourne, and Dwayne Johnson and Jason Statham now fill the Arnie/Sly void, but there’s no modern Indy. Will anyone ever succeed him? Shia LaBeouf didn’t manage it as his literal heir in Crystal Skull. Of course, there’s still some mileage left in the tank. Want to find out who the rest of the 100 greatest movie characters are? Pick up a copy of Total Film magazine now or subscribe so you never miss any issue.